Kendrick Lamar released his dazzling DAMN. LP last week, and not even a full seven days removed from the drop, the rapper has shared a video for the album's urgent "DNA." 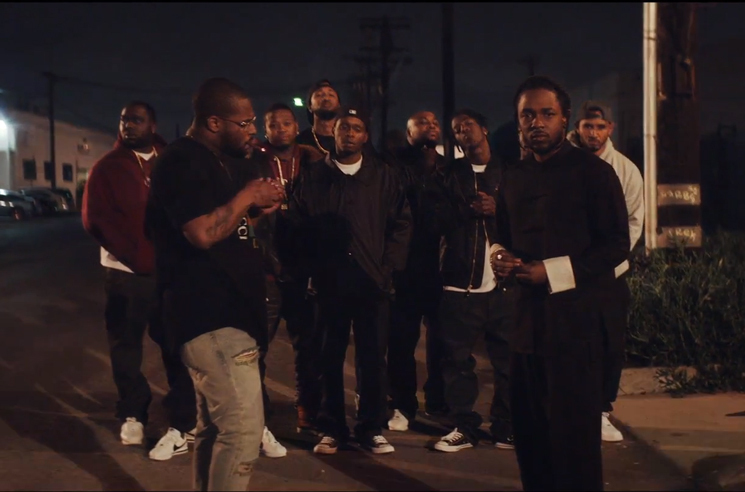 Directed by Nabil & the Little Homies (Lamar and Top Dawg Entertainment president Dave Free), the clip opens with a suited Don Cheadle interrogating Kendrick inside a warehouse. His lie detector tactics are no match for the mind of Kung Fu Kenny, however, with the rapper freeing himself after some back-and-forth with Cheadle's character. With the beat switch comes greyscale footage of Kendrick rapping his furious final verse, loaded with jump cuts of him shooting dice in the street and playing pool in a room with some shiny Grammy awards on display. DAMN. is out now through Aftermath/Interscope/Top Dawg. Watch the video for "DNA." in the player below. Pre-order DAMN. on CD here.